In locating the birthplace of Mary Hughes, the real break came with her brother, Patrick Hughes. I always try to find descendants of a common ancestor up to the present day if possible. It answers so much questions and says a lot about migration patterns and family dynamics as well. It’s critical to get all the information possible about every single relative, no matter how remote, the children of second cousins and beyond. Also get records for close associates, such as naturalization witnesses and neighbors. I have solved many mysteries this way. My Irish ancestors came a lot earlier–1840s and 50s–and records are thin on the ground but this technique has been gold. I couldn’t agree more. What’s critical is the pattern recognition. Sometimes I draw really big network charts on a large sketch pad to figure out how they all fit together. Definitely needed with Irish research and as a brick-wall-buster! It’s also really helpful for identifying those missing women during that dark age before the 1850 census. 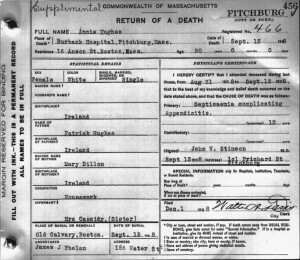 I too am slogging through Hughes family Henry who left Ireland in 1848 with wife Rosannah Rafferty children Arthur and Mary went to Glasgow Scotland long enough to earn passage money and have tree more son before settling in Argyle Co and Warren Co, NY. Alas, New Yorks record are not as available digitally -yet! 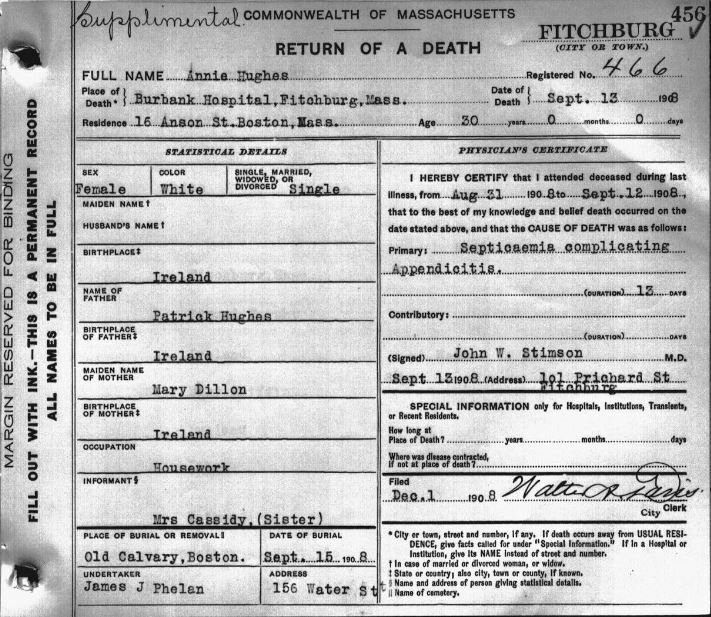 I had a brick wall for an ancestor who died in 1835 at the age of 30 in New Hampshire. His death record didn’t have any information about his father. After several years of hearing “check the siblings” I tried to find his siblings’ death records. He had three brothers who lived into their 70s/80s. At that time New Hampshire was asking about the parents of the deceased. The only problem was that one brother’s listed his father’s birthplace as Boscawean NH, another listed Byley MA and the third listed Beverly MA. At least this gave me some clues about where to look. It turned out that the father had been born in NH but the family had moved from Byley (part of Newbury) to New Hampshire and I found out some about the family at the library at Nebrury/Byley (that library is located about 5 miles from where my summer condo is).